Positive: Compact size; light weight; simple design; solid workmanship; nice display; decent speakers. Positive: Impressive design; compact size; light weight; nice display. Negative: High price. Positive: Impressive design; premium design; long battery life; nice performance. Positive: Elegant design; solid workmanship; high performance. Positive: High performance; smart stylus pen; long battery life; nice selfie camera. Negative: Poor display. Positive: Nice design; powerful hardware; large screen. Positive: Impressive design; compact size; decent hardware. Positive: Powerful hardware; smart stylus pen; high performance. Negative: Expensive; mediocre speakers. Positive: Excellent display; smart stylus pen. Negative: Expensive. Positive: Powerful processor; solid workmanship; high autonomy; fast system; excellent display; comfortable keyboard; good speakers. Negative: Poor connectivity; high price. Positive: Nice performance; excellent display; good speakers; large battery capacity. Negative: Noisy under loads; uncomfortable keyboard; high price. 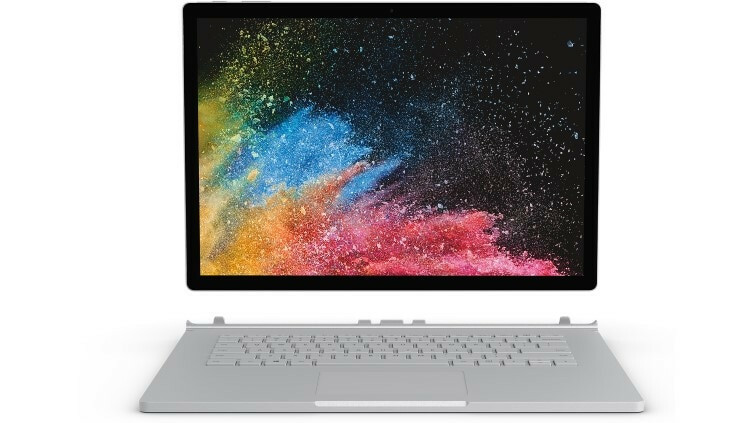 The Microsoft Surface Book 2 15 is the manufacturer’s attempt at making a touchscreen Windows device with digital ink support. They pushed it to the limit with a larger 15-inch display, a more powerful processor, and discrete graphics. Instead of just being one device that flips inside out, like most of the best 2-in-1 laptops, the Surface Book 2 is truly two devices in one. It is designed to increase productivity, especially for business professionals. The Surface Book 2 is far more protected than the original Surface Book, especially now that Intel has released patches with Microsoft through the Windows 10 update tool that makes the Surface Book 2 much more resilient to the Spectre and Meltdown CPU exploits. But the Surface Book 2 is not just about improved security. It takes the pristine design of the original Surface Book and modernizes it ever so slightly to please the critics. The hinge, for instance, is much more sturdy. Like its predecessor, the Surface Book 2 has a hefty metal chassis coated in a professional, elegant matte silver coat that tries to distinguish itself from other devices. 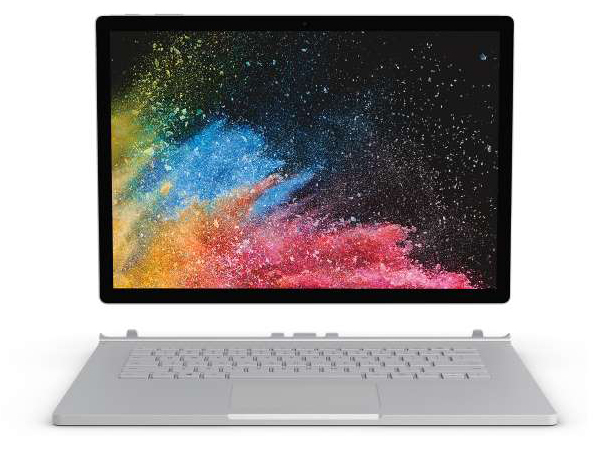 At the heart of the Microsoft Surface Book 2 15 sit an 8th-gen Intel Core i7 processor, 16 GB of RAM, a 256GB solid-state drive, and Nvidia GTX 1060 graphics. The hardware in this system is quick, and users are expected to pay up. The Surface Book 2 should last at least five years, thanks to its powerful hardware and contemporary features. Simply put, this is the strongest 2-in-1 laptop, ready to go toe-to-toe with not only every hybrid laptop on the market but also a wide range of gaming laptops. And with Windows 10 S mode incoming soon, it is likely for users to be able to squeeze even more performance out of the Surface Book 2. The 15-inch touchscreen on the Surface Book 2 offers a 3,240 x 2,160 resolution in a 3:2 aspect ratio. While not quite 4K, it does cram 260 pixels into every inch, which is more than enough to offer a perfectly sharp image. The Surface Book 2’s average color error came in at 3.96 (lower is better). This relatively high reading is due to overblown colors. Everything looks too bright and too vibrant. While it is not unappealing to the naked eye, it is not accurate and may throw off photographers, graphics, and video editors. However, maximum brightness came in at 428 nits, which is slightly behind the MacBook Pro but defeats most other laptops and 2-in-1s. A laptop with a 15-inch screen is large enough to deliver strong audio, and the Surface Book 2 is no exception. Its beefy stereo sound has no problem filling a mid-sized room with music. Microsoft has blessed the 15-inch model with an outstanding 90 watt-hours of juice. Most of the battery is still in the base of the Surface Book 2. If the user detaches the screen and moves to tablet mode, they will only get an hour or two of usable work. However, when attached, the user will get up to seven hours of battery life. Positive: Large screen; nice display; powerful hardware; backlit keys. Negative: High price. NVIDIA GeForce GTX 1050 (Laptop): Mainstream graphics card based on Nvidia's Pascal architecture and successor to the GeForce GTX 960M. Is manufactured in a 14nm process at Samsung and the technical specifications are very similar to the desktop version.These graphics cards are able to play the latest and most demanding games in high resolutions and full detail settings with enabled Anti-Aliasing. 84.91%: This rating should be considered to be average. This is because the proportion of notebooks which have a higher rating is approximately equal to the proportion which have a lower rating.» Further information can be found in our Notebook Purchase Guide.